It's Wonderful Wednesday time!! We hope you can play along!! As always....it's ANYTHING GOES!! Break out your Kraftin' Kimmie Stamps and get crafty!! 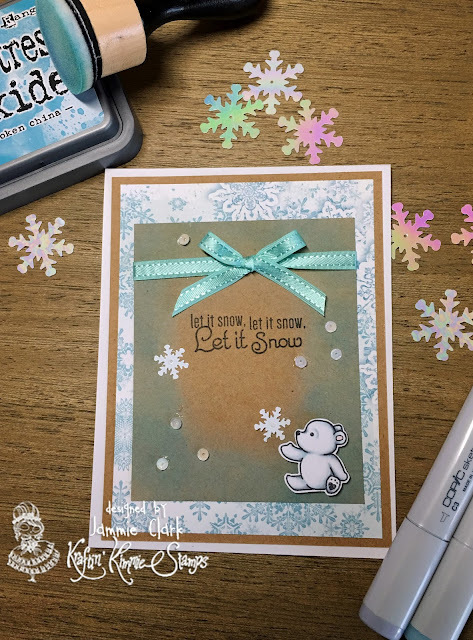 I use the adorable set called "Shake it Up - Polar Bears" and some of the sequins I mix. The paper is from Echo Park and the ribbon is from SU! I also used two of my distress inks, the antique linen and the broken china, to add some color to the Kraft card stock. I hope you love it! We want EVERYONE to be able to play along so your submission can use ANY stamp and can be any theme, any style, any design and it can be a card, a scrapbook page, an altered item....you name it!! It must be a NEW creation and you can enter on this post until November 7th at midnight! At the end of the month one random winner will be chosen from all the submissions for the whole month and will receive a $20 Gift Card to the shop!!! What do you think.....wanna WIN?? Let's see your krafty stuff!! Have a wonderful week, see you Saturday! Tootles! All this card is just darling ! I love the papers that you used !